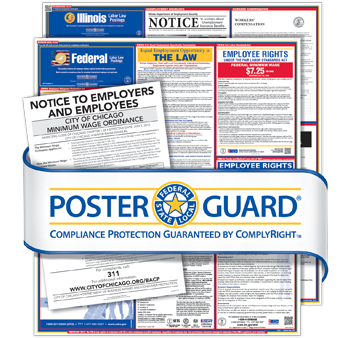 With your subscription you are 100% covered for all changes to Federal, State and Local Labor Law Posters. All posters are sent automatically, you just have to pin them up! Again. Compliance is automatic and guaranteed for a full year. The complexity of posting compliance requirements continues to multiply. In fact, local postings are the newest and fastest-growing area of compliance today. If your city or county doesn’t require specific postings yet, it probably will soon. With Poster Guard® Compliance Protection service, you can have peace of mind knowing you are covered from all directions – all year. Our in-house legal team continually monitors more than 22,000 cities and counties, in addition to federal and state agencies to provide you with unmatched labor law poster service. ALASKAThe Alaska minimum wage increased from $9.80 an hour to $9.84 an hour effective January 1, 2018. The ComplyRight Alaska state labor law poster includes the most up-to-date mandatory posters including the Minimum Wage, Workers’ Compensation, Unemployment Insurance, Smoking Notice, OSHA and Right to Know posters. ARIZONAThe Arizona minimum wage increased from $10.00 per hour to $10.50 per hour effective January 1, 2018. The ComplyRight Arizona state labor law poster includes the most up-to-date mandatory posters including the Minimum Wage, Workers’ Compensation, Unemployment Insurance, OSHA, Workplace Bodily Fluids Exposure, Constructive Discharge, No Smoking, E-Verify and Right to Work, Exposure to MRSA, and Fair Employment. CALIFORNIAThe minimum wage in California increased from $10.50 an hour to $11.00 an hour for employers with 26 or more employees effective January 1, 2018. Employers with 25 or fewer employees increased from $10.00 per hour to $10.50 per hour effective January 1, 2018. The ComplyRight California state labor law poster includes the most up-to-date mandatory posters including Minimum Wage, Workers’ Compensation, Unemployment Insurance, No Smoking, Payday Notice, Emergency Numbers, Access to Medical Records, Family Care and Medical Records, Pregnancy Disability Leave, Discrimination and Harassment, OSHA, Time Off for Voting, Whistleblower Protection Act, and Minimum Wage Supplement. COLORADOThe Colorado minimum wage increased from $9.30 an hour to $10.20 an hour for non-tipped employees and from $6.28 an hour to $7.18 an hour for tipped employees effective January 1, 2018. The ComplyRight Colorado state labor law poster includes the most up-to-date mandatory posters including the Minimum Wage, Workers’ Compensation Part 1 and 2, Unemployment Insurance, Pay Day Notice, Fair Employment, and Pregnancy Accommodations. DISTRICT OF COLUMBIAThe District of Columbia minimum wage increased from $12.50 an hour to $13.25 an hour effective July 1, 2018. The ComplyRight District of Columbia state labor law poster includes the most up-to-date mandatory posters including the Minimum Wage, Workers’ Compensation, Unemployment Insurance (must be obtained from state), Protecting Pregnant Workers, Wage Theft Prevention, Child Labor (must be obtained from D.C. Public Schools), Fair Employment, Accrued Sick and Safe Leave Act, Right to Breastfeed, and No Smoking. FLORIDAThe minimum wage in Florida increased from $8.10 an hour to $8.25 an hour effective January 1, 2018. The minimum wage for tipped employees will also be increased from $5.08 per hour to $5.23 per hour in addition to tips. The ComplyRight Florida state labor law poster includes the most up-to-date mandatory posters including the Minimum Wage, Workers’ Compensation, Unemployment Insurance, Child Labor, and Fair Employment. HAWAIIThe Hawaii minimum wage increased from $9.25 an hour to $10.10 an hour effective January 1, 2018. The ComplyRight Hawaii state labor law poster includes the most up-to-date mandatory posters including the Minimum Wage, Workers’ Compensation, Unemployment Insurance, Whistleblower Protection, OSHA, and No Smoking. MAINEThe Maine minimum wage increased from $9.00 an hour to $10.00 an hour effective January 1, 2018. The ComplyRight Maine state labor law poster includes the most up-to-date mandatory posters including the Minimum Wage, Workers’ Compensation, Unemployment Insurance, Whistleblower Protection, Sexual Harassment, Child Labor, Video Display Terminal Law, and Regulation of Employment. MARYLANDThe minimum wage in Maryland increased from $9.25 an hour to $10.10 an hour effective July 1, 2018. The ComplyRight Maryland state labor law poster includes the most up-to-date mandatory posters including the Minimum Wage, Workers’ Compensation, Unemployment Insurance, Equal Pay for Equal Work, Fair Employment, Child Labor, Health Insurance, OSHA, and No Smoking. MICHIGANThe Michigan minimum wage increased from $8.90 an hour to $9.25 an hour effective January 1, 2018. The ComplyRight Michigan state labor law poster includes the most up-to-date mandatory posters including the Minimum Wage, Whistleblower Protection, Unemployment Insurance, Fair Employment, Right to Know/MSDS, No Smoking, OSHA, and Child Labor. MINNESOTAThe Minnesota minimum wage increased from $9.50 an hour to $9.65 an hour for companies with annual gross revenues of $500K or more and for small employers from $7.75 an hour to $7.87 an hour. Increases are effective January 1, 2018. The ComplyRight Minnesota state labor law poster includes the most up-to-date mandatory posters including the Minimum Wage, Fair Employment, Unemployment Insurance, OSHA, Workers’ Compensation and No Smoking. MISSOURIThe Missouri minimum wage increased from $7.70 an hour to $7.85 an hour effective January 1, 2018. The minimum wage employers must pay tipped employees will also increase from $3.85 an hour to $3.925 per hour. The ComplyRight Missouri state labor law poster includes the most up-to-date mandatory posters including the Minimum Wage, Workers’ Compensation, Unemployment Insurance, Child Labor, No Smoking, and Fair Employment. MONTANAThe minimum wage in Montana increased from $8.15 an hour to $8.30 an hour effective January 1, 2018 based on the cost-of-living adjustment. The ComplyRight Montana state labor law poster includes the most up-to-date mandatory posters including the Minimum Wage, Workers’ Compensation (must be obtained from state), Unemployment Insurance (must be obtained from state), Fair Employment, and No Smoking. NEW JERSEYThe New Jersey minimum wage increased from $8.44 an hour to $8.60 an hour effective January 1, 2018. The ComplyRight New Jersey state labor law poster includes the most up-to-date mandatory posters including the Minimum Wage, Employee Recordkeeping Requirements, Family Leave Act, Family Leave Insurance, Wage Payment, Conscientious Employee, Unemployment Insurance, Fair Employment, Workers’ Compensation, Workers’ Compensation (self-insured), Child Labor Part 1 and 2, and No Smoking. NEW YORKThe minimum wage for New York State will increase from $9.70 per hour to $10.40 per hour effective 12/31/2017. The ComplyRight New York state labor law poster also includes the New York City minimum wage increase of $13.00 per hour for large employers, $12.00 for small employers and the Long Island and Westchester County minimum wage increase of $11.00 per hour, effective 12/31/2017. The ComplyRight New York state labor law poster includes the most up-to-date mandatory posters including the Minimum Wage, Fair Employment, Right to Know, Fringe Benefits and Hours, Time Off to Vote, Correction Law, Workers’ Compensation (must be obtained from insurance carrier), Unemployment Insurance (must be obtained from state), Disability Benefits (must be obtained from insurance carrier), No Smoking, and Smoking Permitted. OHIOEffective January 1, 2018 the minimum wage in Ohio increased from $8.15 an hour to $8.30 an hour for non-tipped employees, and from $4.08 per hour to $4.15 per hour for tipped employees. The ComplyRight Ohio state labor law poster includes the most up-to-date mandatory posters including the Minimum Wage, Workers’ Compensation (must be obtained from state), Child Labor, Fair Employment, and No Smoking. OREGONThe minimum wage in Oregon will increase from $10.25 an hour to $10.75 effective July 1, 2018. The ComplyRight Oregon state labor law poster includes the most up-to-date mandatory posters including the Minimum Wage, Family Leave Act, OSHA, Workers’ Compensation (must be obtained from insurance carrier), Unemployment Insurance (must be obtained from state), and No Smoking. RHODE ISLANDThe Rhode Island minimum wage increased from $9.60 an hour to $10.10 per hour non-tipped employees, and from $3.39 an hour to $10.10 an hour effective January 1, 2018. The ComplyRight Rhode Island state labor law poster includes the most up-to-date mandatory posters including the Minimum Wage, Workers’ Compensation, Unemployment Insurance, No Smoking, Pregnancy Discrimination, Fair Employment, Right to Know, Parental & Family Leave, and Whistleblower Protection. VERMONTThe Vermont minimum wage increased from $10.00 an hour to $10.50 an hour effective January 1, 2018. The ComplyRight Vermont state labor law poster includes the most up-to-date mandatory posters including the Minimum Wage, Workers’ Compensation, Employer’s Reinstatement, OSHA, Sexual Harassment, Family and Medical Leave, Child Labor, Unemployment Insurance, and Posting of Safety Records. President Franklin D. Roosevelt initiated the Fair Labor Standards Act (FLSA) in 1938, establishing minimum wage, overtime pay, recordkeeping, and youth employment standards affecting employees in the private sector and in Federal, State, and local governments. At the time, the federal minimum wage was set to 25 cents an hour and has continually increased over the years, most recently in July 2009 with $7.25 an hour. Minimum wage applies to an estimated 84 percent of the labor force today, particularly in the food service industry. Labor law compliance for individual state varies. States have the ability to provide higher minimum wages and more protective laws than the federal FLSA.